Ceramic Tile Trends is the sole U.S. importer of Cerâmica Antigua. The Antigua line, which includes some of the world's most decorative high-end wall tiles, has been produced for more than a quarter of a century. The process is as much of an art studio as it is a factory. Most of these hand crafted tiles are 4"x4" and 5"x5" ceramic wall tiles with designs conceived by a dedicated team of artists. They work slowly and meticulously, continually eliciting unique new designs and amazing reproductions. The result of their efforts is a one-of-a-kind tile collection that ends up in the homes of sophisticated owners. 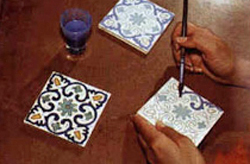 Antigua also produces a few lines of unique floor tiles, as well as an abundance of decorative moldings and accessories that complement the wall tiles. In addition to the decorative Antigua Collection, CTT also is the exclusive North American provider of exquisite Murvi glass mosaics, a world-class collection featuring an amazing palette of brilliant colors. Words cannot describe the beautiful products Ceramic Tile Trends brings to the market. In order for you to experience the world's most stunning decorative tile collections, contact your dealer today and arrange to witness these materials firsthand. Be prepared to see individual tile pieces that would not be out-of-place displayed in art galleries!